Capture huge landscapes, abstract details and portraits of locals. 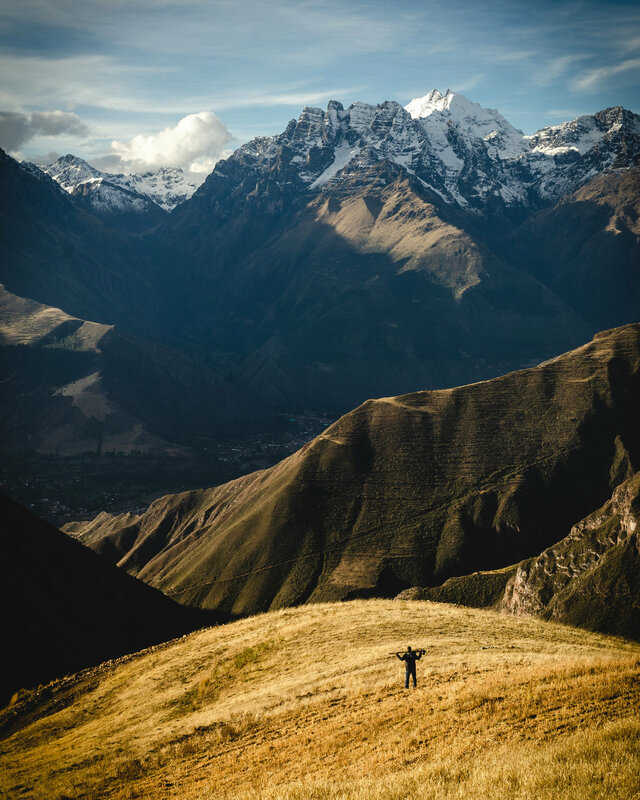 Professional, multilingual guide to help you discover the Andes in a unique and fun way. Sunday bonus: Capture amazing photos of a traditional market in the Andes. 9h30 - Pick-up from hotel or hostel and begin our drive into the Andes. 10h15 - Quick stop to shoot at a viewpoint along the way. 10h45 - Stop in Chinchero to pick up empanadas for lunch. 12h00 - Workshop at Maras Salt Mines. 13h30 - Lunch at Huaypo Lake, then time to shoot this beautiful location. 15h00 - Landscape workshop at our secret location. 16h00 - Begin the journey back to Cusco, expected arrival around 17h00. 9h00 - Pick-up from hotel and hostel and begin our drive into the Andes. 9h45 - Quick stop to shoot at viewpoint along the way. 9h30 - We begin our tour by picking you up from your hotel or hostel with our private car to begin our drive into the Andes. 10h15 - Our first stop is at a lesser known viewpoint that gives you a spectacular mountain view. There's a pretty neat spot here that allows for a unique picture in which you can place your subject directly in front of the mountain range in the background (break out the telephoto lens for compression of scale!) We can take this shot for you with you as the subject if you so wish. We explore this location for around 30 minutes before jumping back in the car and moving on. 10h45 - We make a quick stop in Chinchero to pick up some local empanadas to eat for lunch a little later in the day. 11h00 - We stop by a local artesenal textile market in Chinchero to learn a little of the textile making process that Chinchero is famous for, after the demonstration we will have the opportunity for a great portrait session with the ladies there, they are always wearing full traditional outfits and are happy to have some photos taken of them. 12h00 - We arrive at Maras salt mines. This is a known location so expect tourists, these go in big groups and so are rushed in and out. Our private visit to the salt mines allows more time to explore and seek out better compositions for your images. We know some great spots in this photographically rich location. We explore here for around 1h. 13h30 - We move to a lake deep in the Andes. This lake is surrounded by colourful fields of agriculture and the Andes mountains as it's backdrop! At this lake we will take some time to relax and eat our empanadas before shooting in the area. 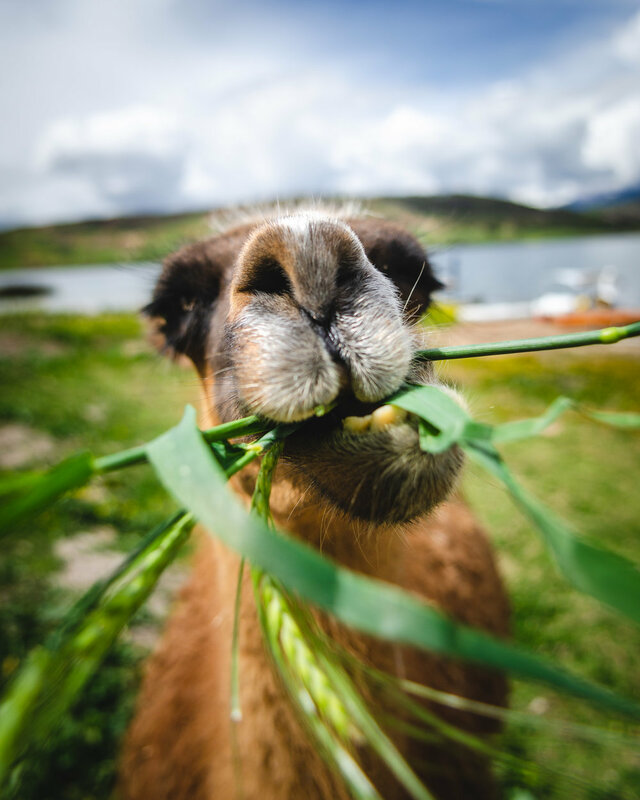 The area is full of llamas, alpacas and other animals, here we can get close and take plenty of photos of them. 15h00 - We reach our next location that is around 4000m ASL where we find a full panoramic view of the area with wonderful scope for landscape photography. This location is a private field belonging to a family of potato farmers that give us access to this unique location! If we are lucky on this field we can find friends and family of the owners farming the lands and herding their sheep, this makes for amazing on-location portrait documentary work. The light and direction of the sun at this hour allow for very complete landscape shots with highlights, shadows and different tonalities. 16:00 - Begin the drive back to Cusco. 17:00 - Arrival in Cusco, drop-off at your hotel. Chinchero textile market and the weaving tradition passed through generations. If this tour is booked on a Sunday it will include a visit to a local Andean market that is only open Sundays. Expect to see very little tourism and a lot of locals buying fruit, veggies and wools as well. The workers of this market are typical Quechua people and still dress in a very traditional way. For this reason, this is an amazing location for portraits! The combination of colours in their clothing and hats make for great images. You can also approach specific people for great portraits. 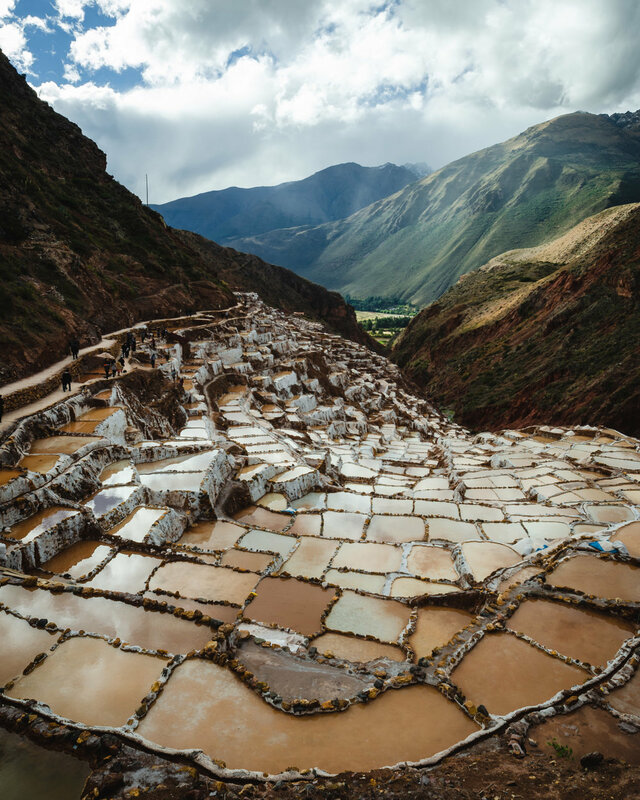 Explore the photographically rich Maras salt mines in your own time and photograph at your leisure in order to seek out the best and most interesting compositions. Meet and photograph locals in incredible locations. End the day with a landscape workshop overlooking monolithic mountains and abyssal valleys to shoot these amazing scenes making the best use of the early evening light.